The Biennale Arte 2017 ends the 26th of November, 2017. It was the ultimate art experience. Coming out of each architecturally unique pavilion into the daylight and serenity of the Giardini with the welcome breezes from the Adriatic was amazing. Fortunately the 1 euro espresso macchiato between the Canada and German pavilions was just perfect. While the Great Britain, Russia, United States, Austria, Romania and Japan Giardini pavilions were grand and memorable, all participating artists’ expressions were important to experience. I will post a curated collection of images. Day 2 was devoted to the Arsenale. 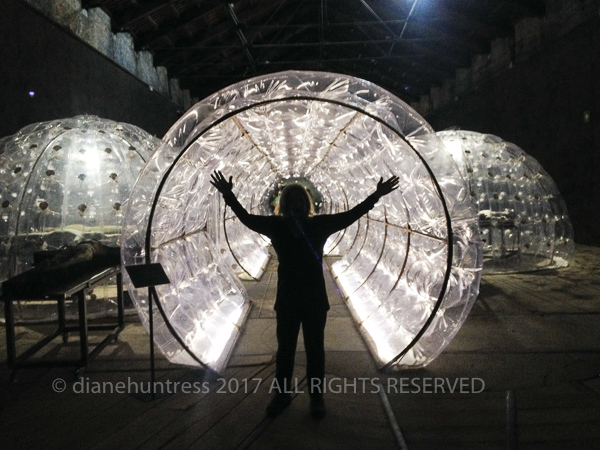 The ultimate art experience continued in industrial spaces with no physical separation between 9 themes or episodes curated by Christine Macel. After that moving outdoors under clear blue sky, followed installations in participating countries – Argentina, New Zealand, Slovenia and the awe of China’s artists. We saved Italy for last. It was dark and mysterious entering in what was described as a ‘basilica-like’ space. The entrance to “Imitation of Christ” by Roberto Cuoghi is pictured below. After having read didactics for two days, I desired only immersion in his installation and would read his statement later. It was a singular experience, amazing and creepy. ‘Il mondo magico’ presents 3 artists who created works about the “transformative power of the imagination and an interest in magic”. A Vitruvian woman in “Imitazione di Cristo” art installation. My tip for attending the Venice Biennale is to go directly to the official book store in the Giardini and purchase their paperback guide. This illustrated guide was about 15 Euro, informative and handy to write in your own notes and impressions. Among other outstanding contemporary art exhibitions we experienced in Europe this year were Lenbachhaus in Munich, Germany and “Colors” at the Castello di Rivoli in Turin, Italy. Installed in the collection in the Castello was Fragments, 2005 by Ai Weiwei. We didn’t expect to see this and I think we held our breaths walking in it. The strength of this sculpture and the space are to be experienced. Below is a link to this show, “Ancient Egypt Gives a New Twist to Turin’s Contemporary Art Week” which just ended. Compliments to Turin. This entry was posted in Architecture, Art, Event, Installation, Italy, Portrait, Uncategorized and tagged 2017, Biennale Arte, Contemporary, Turin, Venice.